Star Trek Into Darkness, the sequel to J.J. Abrams’ 2009 franchise reboot Star Trek, is a thrilling and highly enjoyable film that retains and develops the most promising aspects of the first instalment. It is also enhanced with a greater confidence and thematic complexity. Into Darkness opens with a mission in which Captain James T. Kirk (Chris Pine) is forced to break the Prime Directive in order to save the life of Commander Spock (Zachary Quinto). Upon his return to Earth he is punished for his irresponsibility and relieved of command of the USS Enterprise. However, soon afterwards Starfleet suffers a devastating series of attacks instigated by its own renegade agent John Harrison (Benedict Cumberbatch). With the Federation on the brink of war, Kirk’s command is reinstated and he is dispatched on a stealth mission to hunt down the fugitive. As should be clear from this description, the film carries a heavy underlying resonance with global politics of the last decade or so, in particular the War on Terror. If you had been following the promotional material surrounding Into Darkness, it would have been very easy to get a skewed impression of what the film would be. 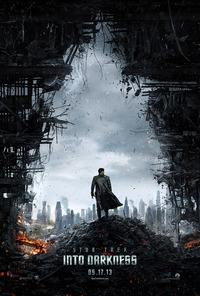 The trailer places an emphasis on civil destruction on Earth and a glowering Cumberbatch and the poster depicts a crashing Enterprise emitting a plume of black smoke. Even the film’s title seem to point towards a Star Trek entering the bleak, nihilistic territory that has increasingly consumed other long-standing franchises, such as Batman and James Bond. Against the apparently interminable War on Terror, humour and humanity seems too often banished in favour of ultra-serious masculine vengeance and reactionary moral lessons. Fortunately, by contrast, Into Darkness is an absolutely delightful and charming film. At a basic level, it is enormously fun, with Abrams’ desire to "do Star Trek like Star Wars" once again proving perfectly-judged. Indeed, the storytelling, breathlessly exciting action and sense of adventure recall the original Star Wars trilogy at its best, presented unabashedly and refreshingly without irony or embarrassment. Yet woven into this is a thematic complexity approached with deftness and intelligence. Despite the radical shift in tempo and texture brought to the series by Abrams, it is ultimately what this film draws from the original Trek that provides its soul. The sense of camaraderie and friendship underpinning the franchise’s liberal humanist values does much to offset and provide a challenge to the darkness suggested by the narrative premise. The new actors are once again fantastic, with the interaction and chemistry between them a highlight throughout. Now that the 2009 film’s divergent timeline plot has been set aside, Pine, Quinto et al are freed from the shadow of the previous cast. They’re given more space to define their characters, and it is substantially more satisfying to see them now confront situations and villains which are "theirs" rather than inherited. Even the vibrant and colourful production design, which verged a little too far into self-conscious pastiche in the predecessor, seems perfectly in service to the film’s values. For it is through its connection to the past that the Into Darkness resurrects the original series’ 1960s utopianism, using it to critique the nihilistic and cynical gloom of an allegorical War on Terror. Its title may be the most peculiarly misjudged element, for ultimately it serves as a wonderful riposte to such "darkness". It is a highly refreshing adventure film, old-fashioned in the best possible way. This review was published on May 11, 2013.